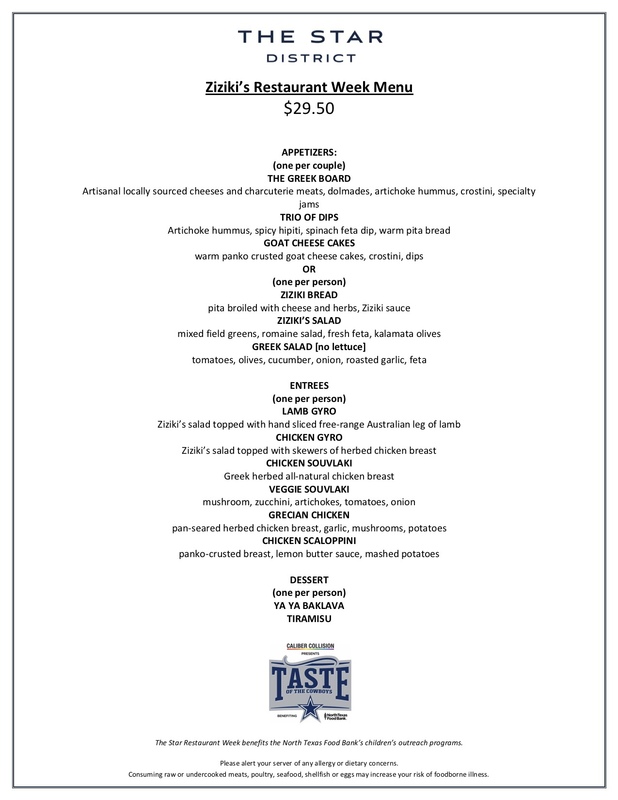 It’s officially Restaurant Week at The Star District in Frisco! Yep, you read that correctly, The Star District has their very own restaurant week that includes each and every restaurant in the district! 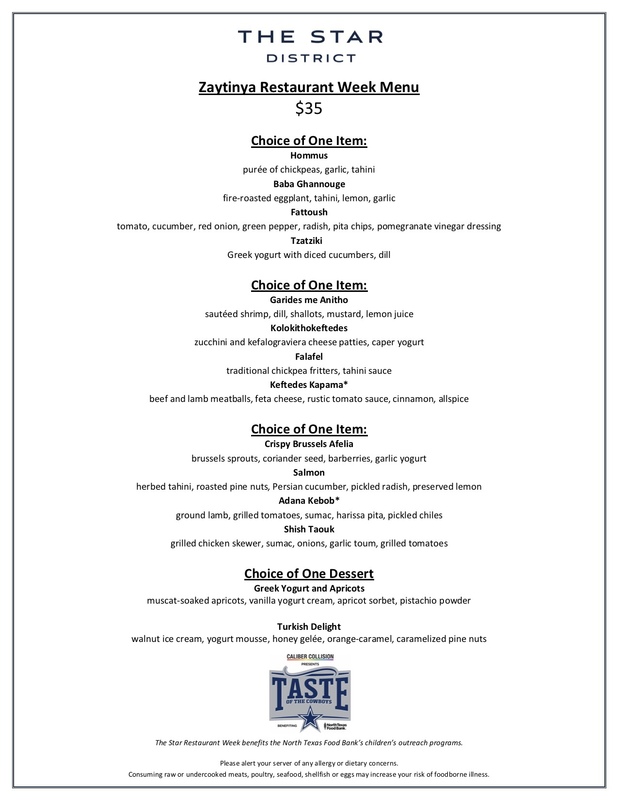 To refresh your memory, restaurant week is when a restaurant offers a prix fixe menu that includes an appetizer, entree and a dessert for a reduced cost (generally around $30-40 a meal) AND 15% of proceeds from restaurant week is donated to North Texas Food Bank. Restaurant week is paradise for foodies, folks! The ability to try out or revisit so many favorite restaurants while giving back to the community? What’s not to love! Now, I get it. You may automatically associate The Star District with The Dallas Cowboys’ corporate offices and training facilities, and while that is a huge aspect of The Star District, it has so much more to offer! With over 25 dining destinations in the district, The Star District has truly become an “it spot” for foodies all over the metroplex. This year, restaurant week runs for almost a month straight, kicking off on September 17th and running through October 14th. 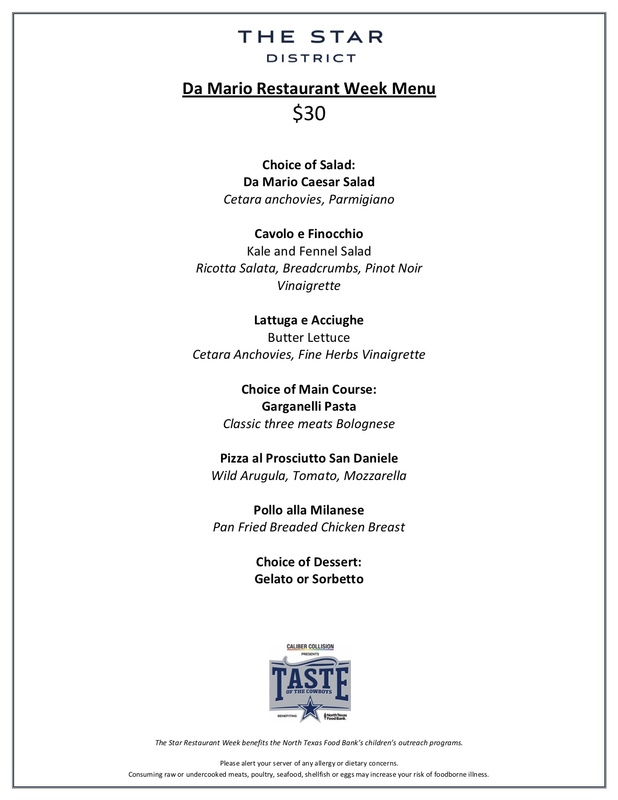 During restaurant week at The Star District, dinings will be offered the regular menu and the specially curated prix fixe menu so don’t worry, you’ll still be able to sample additional offerings if you choose to! I was lucky enough to get a sneak peek at some of the restaurant week experiences at The Star District and can I offer one solid piece of advice…you’re going to want to clear your calendar and start making reservations! With so many dining options at The Start District, you’ve got a lot of ground to cover in the delicious meals that you’ll enjoy during restaurant week so its best that you start NOW! So, shall we get to the goods? The nitty gritty, the yummy, yummier and yummiest? As Cher Horowitz would say, “As If!” Everything was so fabulous, there is no possible way that we’d be able to pick favorites so that just means you’re in luck and will get a peek at all three restaurant week experiences that we attended! With Executive Chef, Luigi Iannuario, running the show, it is no wonder that Da Mario has quickly earned a reputation for consistently fabulous Italian food. Their menu offers traditional favorites, including homemade pasta, pizzas and more. The stunning interior is reason enough to visit but the food makes it absolutely exceptional. With two locations in Dallas and one in Plano, Zizikis is beloved by many and while you may think you know the vibe at Zizikis their new Frisco location at The Star District changes the pace. With a two-story dining room and gorgeous outdoor patio, Ziziks shows a more mature side than their other locations. Don’t worry though, they offer the same fresh and flavorful food that we all know and love. Inspired by Turkish, Greek and Lebanese cuisine, Chef José Andrés has directed Zaytinya to extreme success! The stunning decor instantly transports you to Europe where the colors are as vibrant as the flavors. The staff at Zaytinya is knowledgeable and makes the sprawling menu approachable, offering suggestions and in-depth explanations. You’re not dreaming. The deals and the menu options really are that good! The fact that 15% of proceeds will be donated back to help the hungry in our community is just the icing on the cake. Be sure to make your visit, or visits, to The Star District by October 14th to get in on the action!